Check Atelier Du Presbytere out at http://atelierdupresbytere.com/. 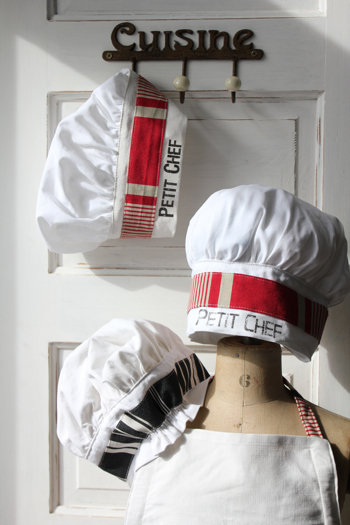 L'atelier Du Presbytere is a company bringing all their materials from France (Provence) and giving them a second life as vintage housewares linen. The items are created with a rustic style that is easily washed and one of a kind. The concept is unique and individually created using antique fabrics, mostly linens. Words are printed with an embroidery sewing machine using a stencil transfer. Posted on August 8, 2015 by Lory MacDonald and filed under Clothing, Handbags, Hats, Other and tagged Artfest Toronto Artfest Clothing Linen Provence Artfest Exhibitors. Hats off to Mad Cap Hats - exhibiting at Artfest! From Sept 4th - 7th at Artfest Toronto, Mad Cap Hats will be displaying their collection of fun and bright hand made hats. A hat for every occasion, style and mood, Mad Cap Hats 'has been turning heads for 25 years'! Proudly made in Grimbsy, Ontario, this company makes UV resistant, reversible and super comfortable hats for the happy hat connoisseur! LIKE Mad Cap Hats on Facebook and thanks for supporting Canadian arts! Posted on August 5, 2015 by Lory MacDonald and filed under Clothing, Other, Hats and tagged Hats Reversible Hand Made Artfest Artfest Toronto. Mad Cap Hats has been topping heads for over 26 years! Congratulations! Artfest is proud to have you as an exhibitor! A fixture at the best artisan shows in Ontario, hats are a passion for milliner, Tori Kosinec. Mad Cap hats are designed to offer Sun Protection with Style! **New beach wraps and beach covers will be available for purchase at Artfest Kingston, 2015 - this Canada Day long weekend, July1st-4th! See you at the show!! Posted on June 18, 2015 by Lory MacDonald and filed under Clothing, Hats and tagged Mad Cap Hats Artfest Kingston Artfest. Hats off to Mad Caps at our Artfest Port Credit show! Mad Cap Hats are a stain, water and UV resistant hat created to be versatile and fun! Original, fashion, sun hats as well as beach wear with 27 years of turning and topping heads! Check out artisan, Tori Kosinec's booth at the upcoming Artfest Port Credit show and get ready for some summer fun and protective shading! Visit - http://www.madcaphats.com/ to see more of their unique and hand-made hat creations! Posted on March 31, 2015 by Lory MacDonald and filed under Hats and tagged Hats Mad Caps Artfest Sun Hats.